A love for hand crafted things, top notch customer service, and “Slow Food,” (aka: home-made) is a Newburgh custom. And you can see this in the kinds of businesses that have been here for some time, as well as in the businesses moving here. According to Wikipedia, Slow Food, is a movement that began in the late 1980’s in Italy. Slow Food emphasizes local traditions, the support of small, local businesses, and the rejection of globalization. 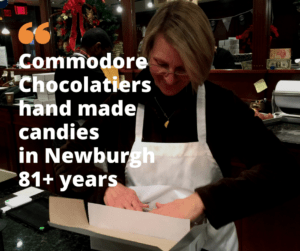 It’s fair to say that Newburgh’s Commodore Chocolatier’s delicious, hand-crafted candy epitomizes the Slow Food movement’s emphasis on tradition. It also exemplifies the preservation of local, small businesses which remain and anchor, and even improve communities such as Newburgh, N.Y., by their presence. 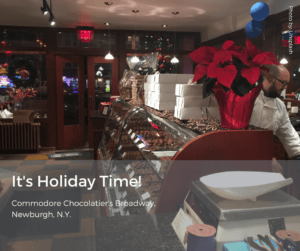 As Newburgh’s historic district continues to rejuvenate, more and more visitors come to Newburgh and decide to stay and in so doing discover one of Newburgh’s crown jewels, Commodore Chocolatier. They are simply discovering what old timers have known for two centuries. Utilizing traditional chocolate-making methods, recipes that have been handed down from generation to generation, and vintage technologies (molds and machines that have remained in the business for decades), Commodore, now in its 81st year, rivals some of the regions greatest chocolate makers in both hand crafted technique and results. They hand-pull and shape candy ribbons and candy canes, to a glistening finish, and are well known for their hand dipped chocolate strawberries. Now a new generation is taking over at the shop. Proprietor, Gus Courtsunis is a third generation chocolate maker inheriting the business from his father, John, who inherited it from his own father, George and George’s partner, George “Pop” Striphus. Gus, an RPI graduate with a degree in engineering, had a career at Corning Glass lined up (and after all, glass-making isn’t such a leap from candy-making) upon graduation, but the pull of his family’s business was just too much to overcome. “He told us when were vacationing in Italy,” beams his mom, Chris, with pride. Chris also (besides teaching science at N.F.A.) helps out in the family business. She couldn’t be more pleased that her son will remain locally and will carry on the tasty and amazing tradition of Commodore Chocolatier’s delicious hand crafted candy. At one time, Commodore Chocolatier’s also made ice cream, but it was their hand-made candies that spread their name far and wide at a time when more than one Greek-owned confectionary shop lined Broadway. Back then, when movie goers would spill out of the cinema, they’d pour into the shops lining Broadway where malted milks and chocolate candies enticed those with a sweet tooth. Commodore Chocolate eventually transitioned to chocolates and sundry candies only. Each season begins to take off in the autumn with a push that continues to build momentum into Christmas. After the New year, Valentine’s day continues the momentum right on into Easter, with graduations, weddings, and many other occasions following. And, in summer, a customer favorite: chocolate covered strawberries. 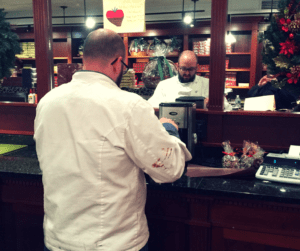 All through the year, locals who have grown up at Commodore Chocolatier’s stop by with their children and grandchildren to indulge in the rich and delicious tradition of buying sweets at Commodore’s. Across decades this family-owned business has shared a special relationship with Newburgh that defines nostalgia in its glamorous storefront facade mixed with a forward looking ambition to bring the newly arrived and the established together in search of the perfect milk chocolate turtle, dark chocolate truffle, or home-made, sundae ice cream topping.